February 3, 2018 at 12:06a.m. 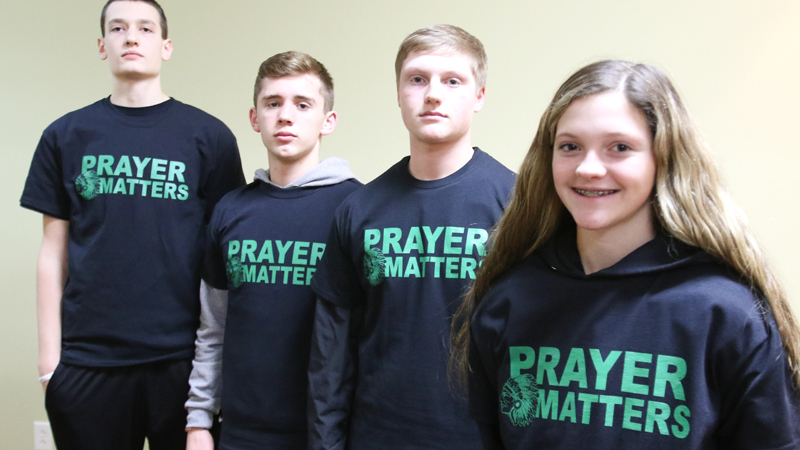 Some members of the West Branch schools community are sporting “Prayer Matters” T-shirts in support of a long-standing tradition that has come under fire. West Branch Schools halted prayer before athletic games after receiving a letter Jan. 18 from the Freedom From Religion Foundation stating the practice is unconstitutional. Tim Saxton, West Branch superintendent, said Tuesday that all prayers were stopped upon receiving the complaint and the district is in contact with its lawyer. But the community wants praying to return. In less than 24 hours from the shirts’ creation, more than 200 $10 “Prayer Matters” shirts have been sold. Fellow parent Brandy Pidgeon said the shirts are the product of an idea from her son, Nick Pidgeon. “To these boys it matters and we want to bring it back if we can,” Brandy Pidgeon said. Everett said the issue isn’t about religion, it’s about taking things students care about away from them. Varsity basketball player Reese Leone, 16, said there’s not much to say about the issue other than to read the shirts. For information about the shirts contact Kristen Everett on Facebook, facebook.com/kristen.d.everett.